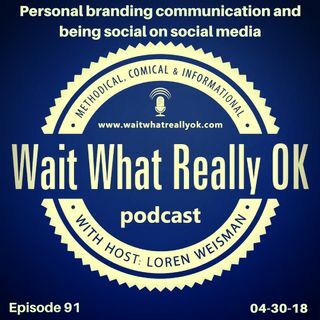 Wait What Really OK Podcast Episode 91 hosted by Branding Strategist talks about how social media is heading back to social as well as the changes that need to be made to keep your content connected. As the algorithms on Facebook and other websites are changing, a key theme of social media and online content going more social is coming into play. From the visibility of online content to the trigger words and phrases that ... See More push content down, the share is much better than the sell. Those that look at social media and online promotion with more of a social engagement aspect are going to do beter as we head in to third quarter of 2018. The personal branding communication in the delivery of content needs to be rooted in authentic authority. Instead of complaining, moving away from the spamming and work off of a foundation that will keep your posts and content elevated to have more opportunity for more eyes to be on it. Episode 91 of the brand strategy podcast Wait What Really OK is called Personal branding communication and being social on social media.